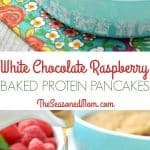 Easy and delicious, make ahead white chocolate raspberry baked pancakes packed with protein. 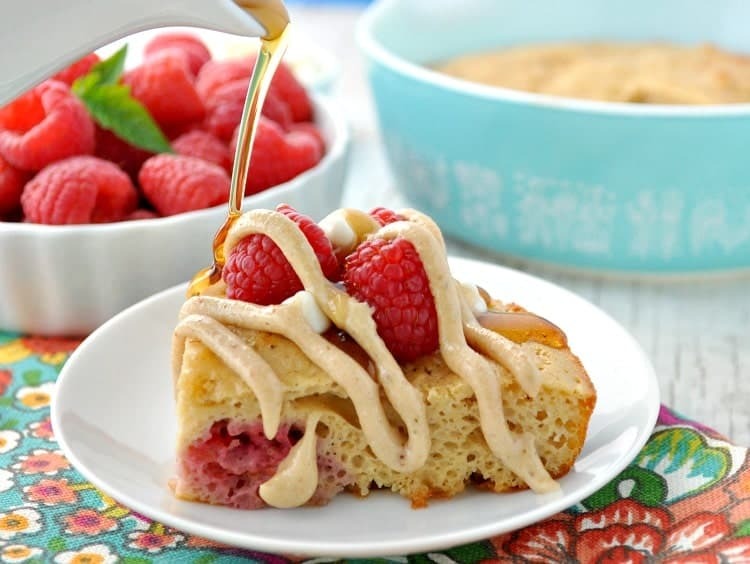 Power up your morning with an easy and healthy breakfast that tastes like a decadent dessert! 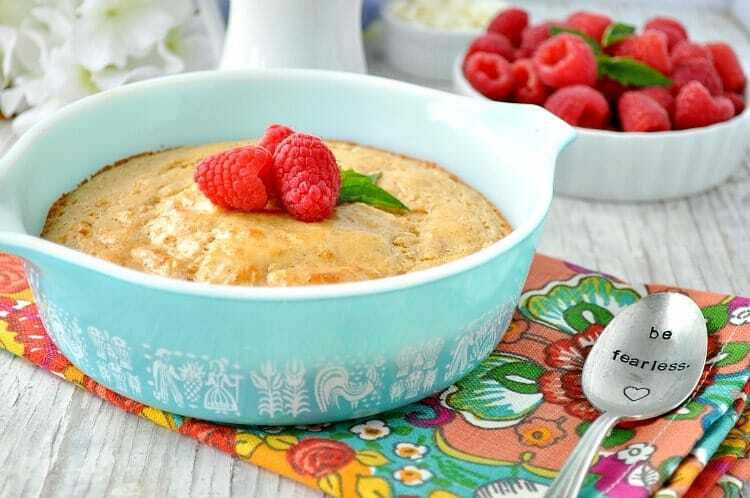 By preparing a dish of White Chocolate Raspberry Baked Pancakes on the weekend, you will have a nutritious, high-protein breakfast option to enjoy throughout the week! I’ve said it on this blog before, and I’ll say it again: my ideal breakfast for maximum staying power MUST have a lot of protein! While I love a traditional bowl of cereal, I find myself hungry 20 minutes later if that’s all I eat. Instead, I try to pack my morning meal with plenty of high-quality protein and healthy fat so that I’m satisfied and energized for my busy day ahead. So imagine my delight when this glorious box arrived from The Vitamin Shoppe’s Protein Pantry! as well as a boatload (or box load?) 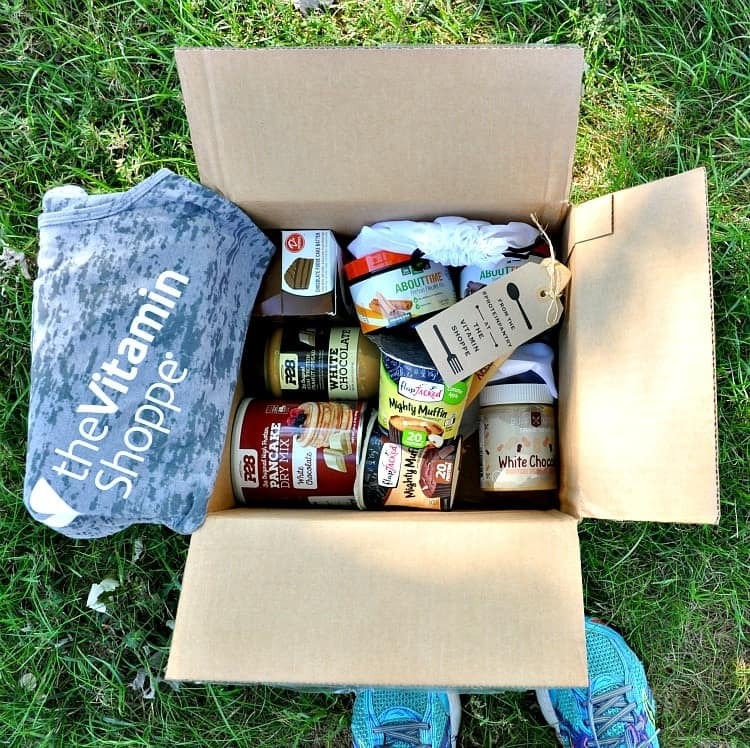 of delicious protein-packed products from The Vitamin Shoppe’s new category — Protein Pantry — which can be found in nearly 700 stores nationwide and online at VitaminShoppe.com. Protein Pantry offers 40 high-protein foods, including nut butters, pancake mixes, powdered nut butters, and more! 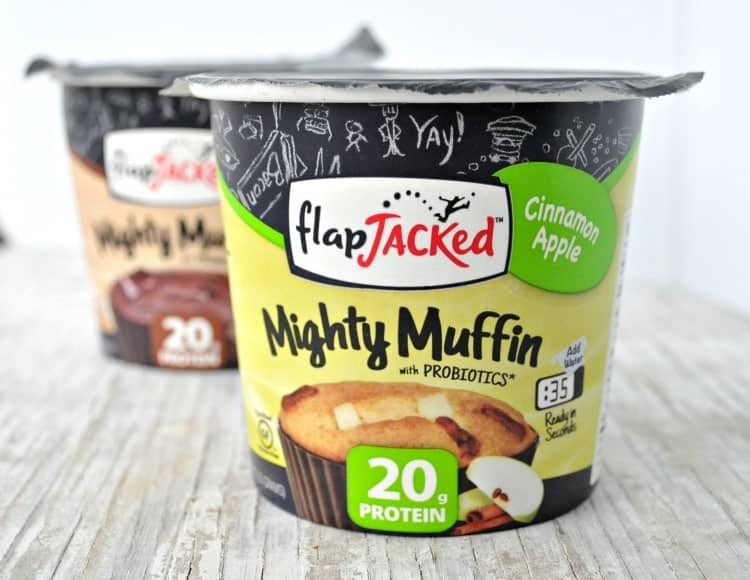 For instance, if it’s a bakery shop muffin that you’re craving, how about opting for a microwaveable FlapJacked Mighty Muffin instead? These goodies are warm, moist, tender, and delicious…and full of 20 grams of protein! The Cinnamon Apple is great with a smoothie for breakfast, while the Double Chocolate muffin is perfect for a sweet evening treat or an afternoon snack at work. 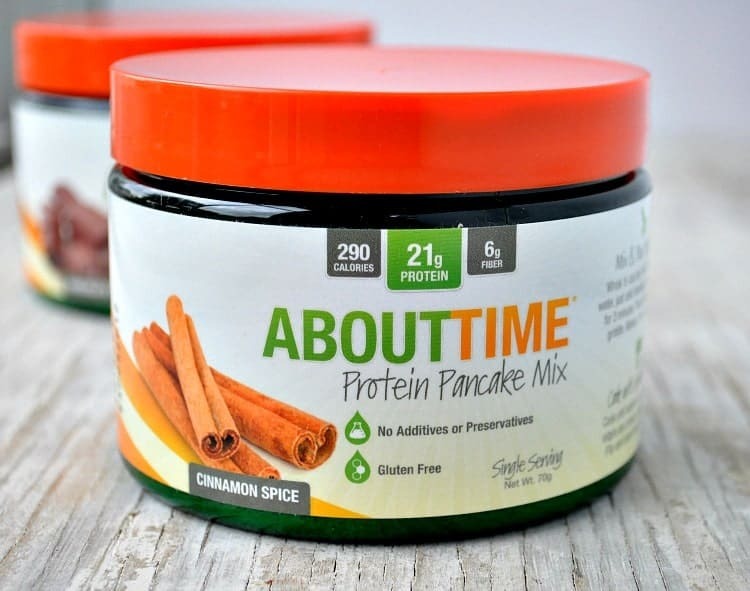 as well as the various Mancakes High-Protein Pancake and Waffle Mixes (available in Buttermilk, Maple Bacon, Light Chocolate, and Cinnamon Oat). There’s even a high fiber maple-flavored syrup to put on top! But no surprise, the nut butters have been my FAVORITE! You guys…there are just so many delicious options! 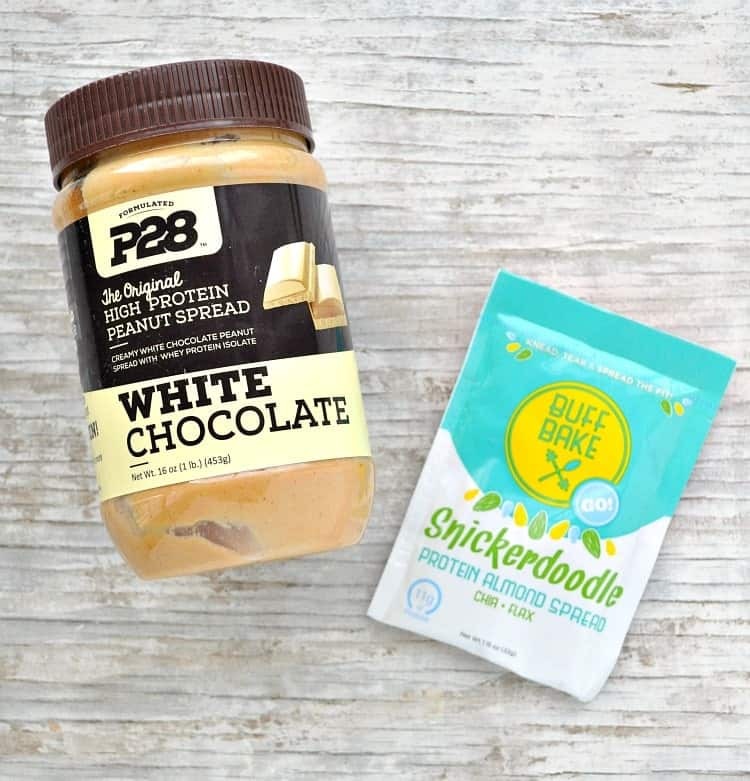 You can’t go wrong with the creamy and rich P28 White Chocolate High Protein Peanut Spread, or the perfectly-spiced Buff Bake Snickerdoodle Protein Almond Spread (which also includes chia and flax). Buff Bake also has a Red Velvet Peanut Butter that I can’t wait to try. 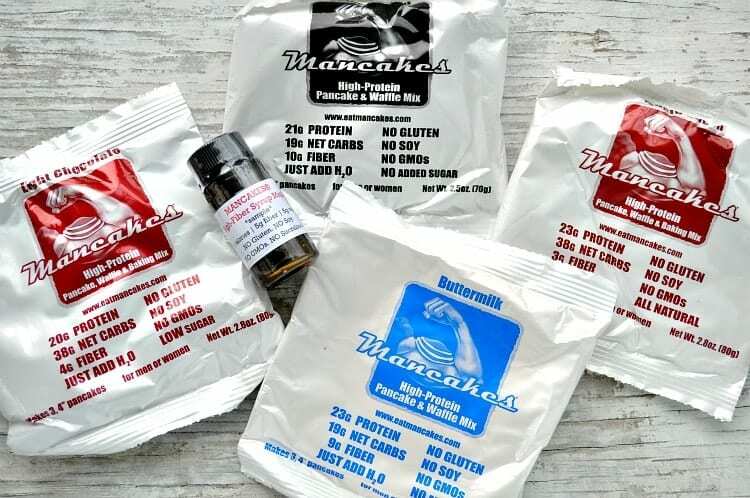 I have used these products on crackers. toast, and English muffins for easy and satisfying breakfasts and snacks over the past couple of weeks. 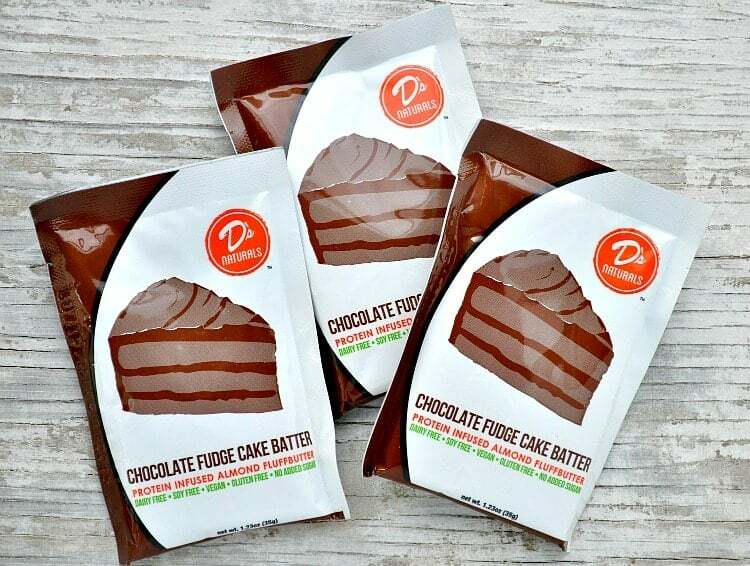 When I’m in the mood for chocolate, this Chocolate Fudge Cake Batter Protein Infused Almond Fluffbutter from D’s Naturals is my absolute favorite. It comes in convenient little single-serve packs too, which are great for busy moms on-the-go, and it honestly tastes just like chocolate cake batter! So, so good. You’re probably not surprised that I’ve had fun experimenting in the kitchen with all of these tasty new products, too! Today I’m sharing one of my favorite new recipes, which is not only delicious and decadent, but it’s also healthy, high in protein and good fat, and easy to make in advance. That’s basically the formula for a perfect breakfast, right?! I love pancakes, but I don’t love standing at the stove to flip the individual hotcakes. Inevitably, I get distracted (shocker, right?!) and burn at least one or two of the pancakes as well. Instead, I much prefer a batch of baked pancakes! Think of it like a pancake casserole! This method is a great way to serve pancakes to a crowd, but it’s also a nice way to make breakfast for the week ahead. You just bake the protein pancakes once, and then reheat individual servings in the microwave as you need them throughout the week (about 30 seconds is all it takes!). 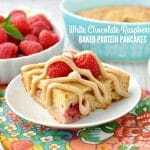 For these White Chocolate Raspberry Baked Pancakes, I used the P28 White Chocolate flavored protein pancake mix. 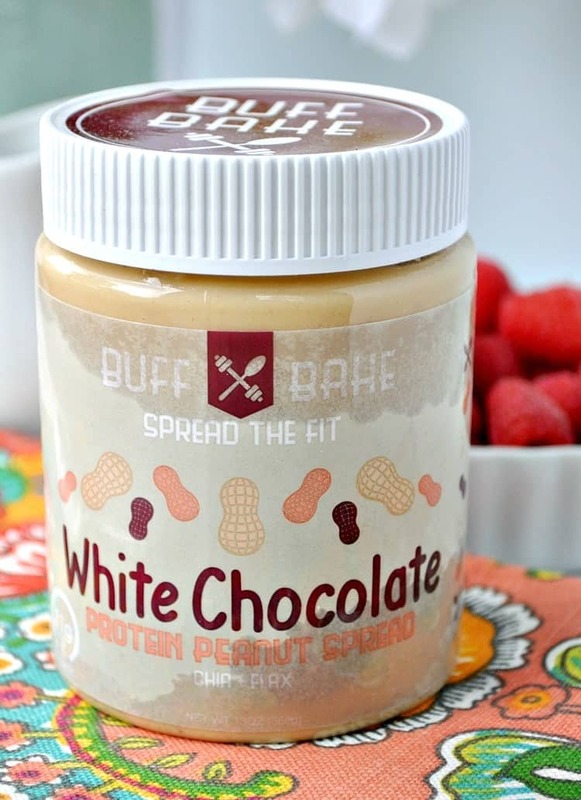 Add a drizzle of the Buff Bake White Chocolate Protein Peanut Spread. If you’re feeling particularly indulgent, finish it off with some warm maple syrup. These are pancakes, after all! 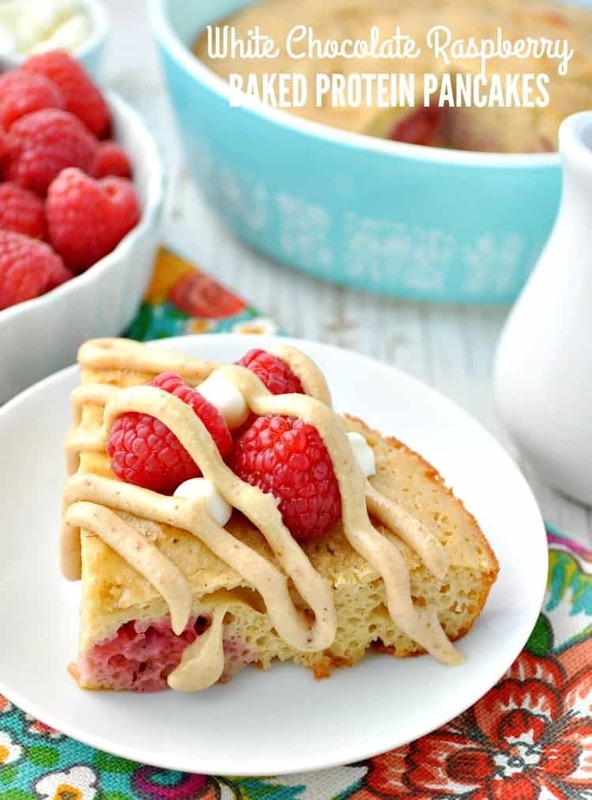 If you’ve tried these White Chocolate Raspberry Baked Pancakes or any other recipe on The Seasoned Mom then don’t forget to rate the recipe and leave me a comment below! You can also follow me on Facebook, Twitter, Instagram and Pinterest to see what I’m getting up to. Heat oven to 400°F (200°C) and spray an 8- or 9-inch square baking dish (or a 9-inch round pie plate or cake pan) with cooking spray. In a medium bowl, beat egg with a whisk. Beat in pancake mix, almond milk, salt, cinnamon, and vanilla. Pour batter into prepared dish and sprinkle with raspberries. Bake for 15-20 minutes, or until edges are golden brown. Slice, garnish with desired toppings, and serve warm. 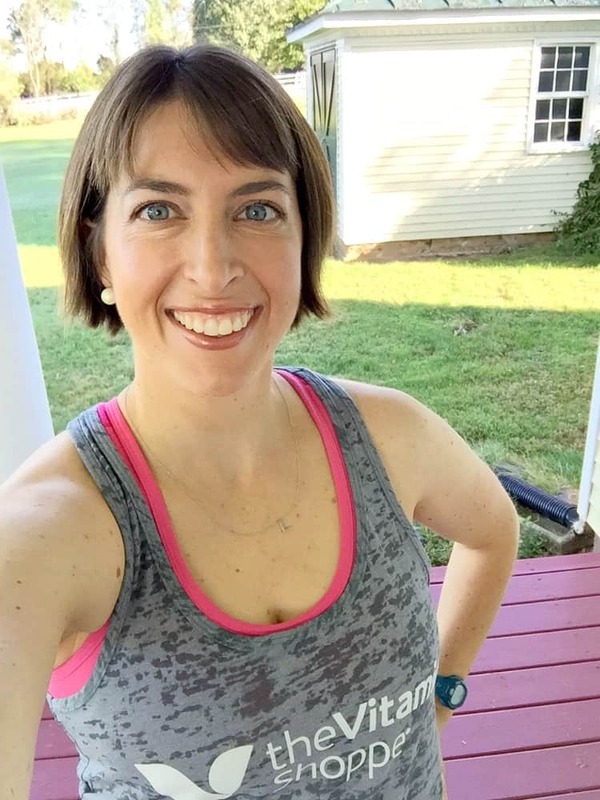 This post is sponsored by FitFluential on behalf of Vitamin Shoppe. All opinions are mine. Previous Post: « Weekend Recap! This sounds like the perfect baked pancake, Blair! I love that you used protein powder in here. Sounds like the best way to get going in the morning. 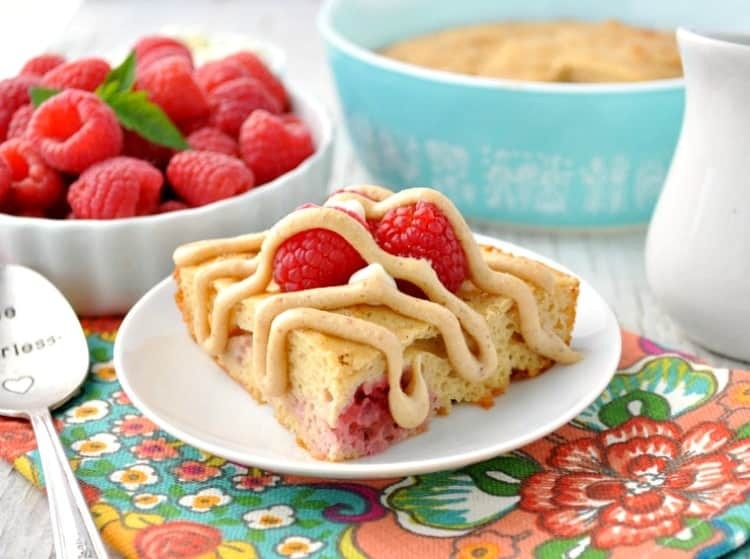 And I love the white chocolate and raspberry combo, too! Thanks, Gayle! It’s definitely a delicious way to start the day! I’ve never baked a pancake! It sounds so much easier that way. And I love that you added protein powder to them. This is my kind of breakfast! Oh, you’ve GOT to try the baked method, Jen! I so agree with the protein for breakfast, but I’d been getting tired of eggs and meat all the time. This looks like a great way to switch it up! Thanks so much, Mary! I’m like you — I get tired of eggs in the morning. Love something sweeter! I’d be out of my mind excited getting that box of goodies in the mail! All those products look so fantastic! 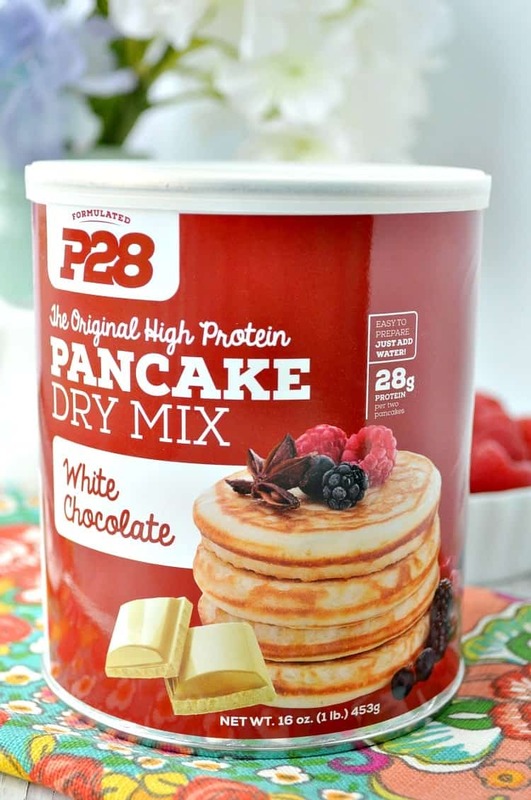 And I love that you used that protein-packed mix to make this big pan of baked pancakes…it looks absolutely delicious, and is the perfect way to kick-start the day! I’ve never baked pancakes before, what a great idea can’t wait to try it!